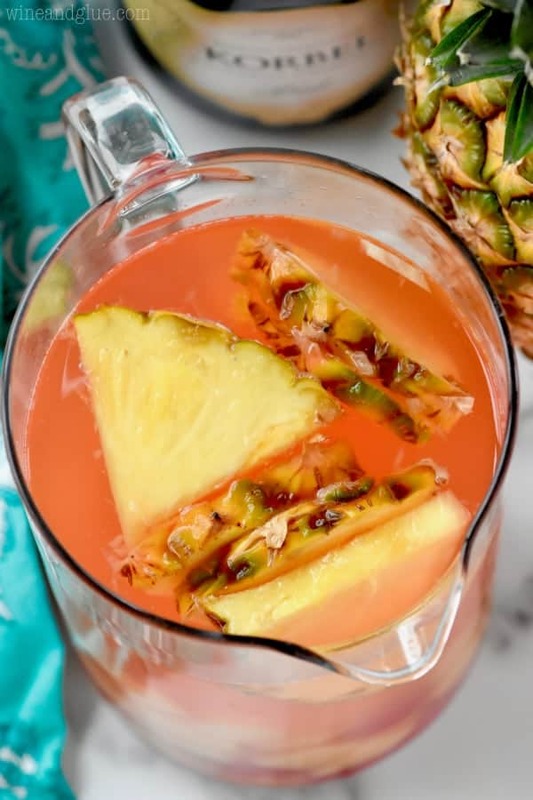 This Pina Colada Rum Punch is the perfect easy recipe for your parties! With only FOUR ingredients, you can make this in about five minutes! File this one with all your party punch recipes! 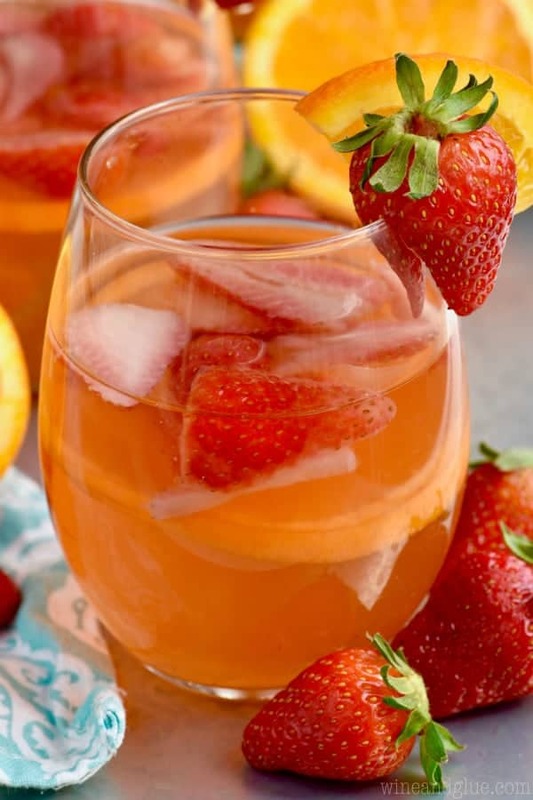 Made with champagne and rum, this is a great punch for a crowd! 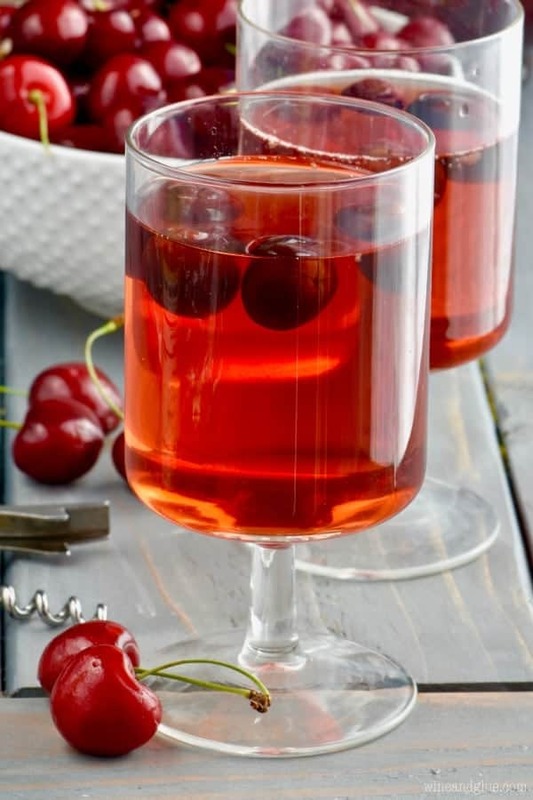 This would be a great summer champagne punch or a great holiday punch recipe! Perfect year round! 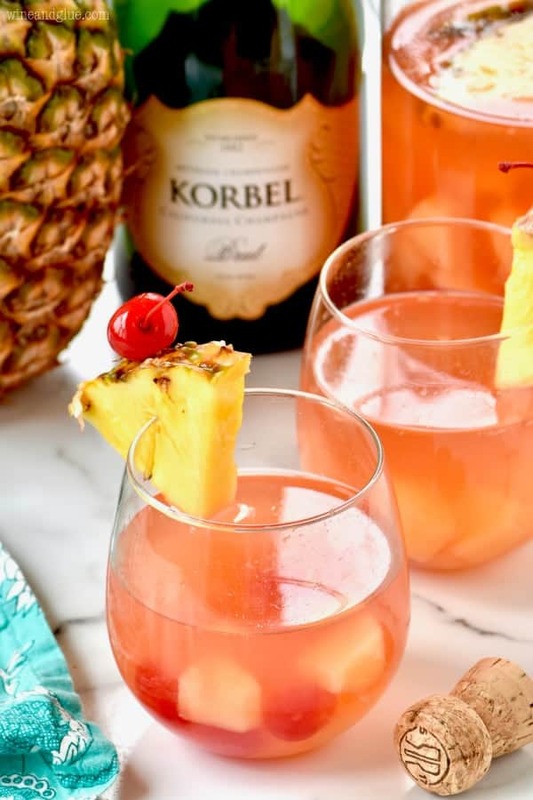 If you are looking for other great party cocktails make sure you try this caramel apple sangria, this cranberry pomegranate champagne cocktail, and of course this lemon champagne cocktail. Are you guys done with your holiday shopping? My husband and I are going for ONE last round of shopping this morning like the weirdos that we are. I mean, seriously. At a certain point you just have the pull the plug on operation Buy All The Things, but we just can’t quit Christmas shopping. This year, I feel like I deserve a gold medal because it is not midnight on Christmas Eve and most of our gifts are wrapped . . . of course if we buy more this morning . . . no, never mind. I’m going to stick with me deserving a gold medal. Or if not a gold medal, then at least a glass of this Pina Colada Rum Punch. It’s only four ingredients, guys. It’s like BEGGING you to make it for New Year’s Eve. Or Christmas Eve Eve. Whatever. This is a spin, and I use spin realllllly loosely here because basically it’s just about the same, on my Pina Colada Sangria – the cocktail that won’t quit. The first cocktail to go viral for me. I love that this is different though. Swapping out the Moscato for Champagne definitely changes the flavor of it. It makes it less sweet and I feel like it makes it more festive. You know, because bubbles. Plus I added maraschino cherries. 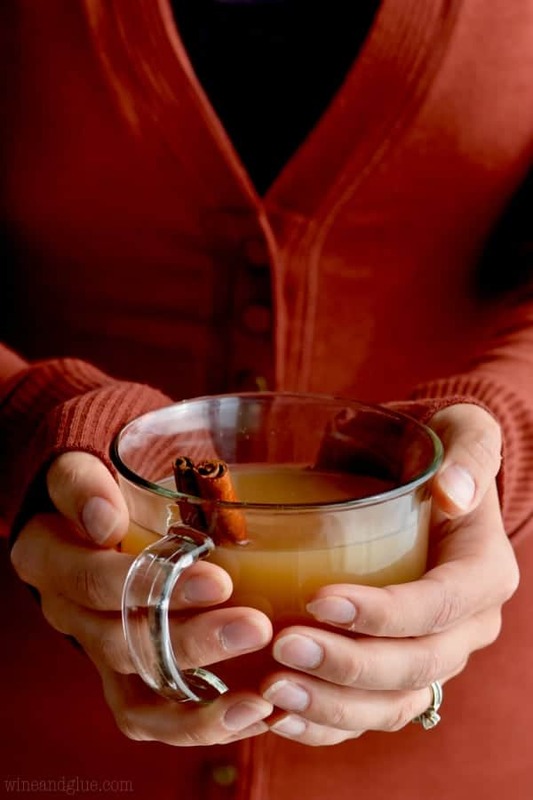 This punch recipe literally takes about five minutes to throw together, so I’m not sure that I can really give you any tips for this recipe, but I do think I can give you some ideas. If you want a sweeter drink, get a bubbly Moscato. It will be very sweet. If you want to stretch the drink and make it less strong (but WHY I ask, WHY???) you could top off glasses with a white soda like Sprite or 7UP or even just some coconut flavored sparkling water. 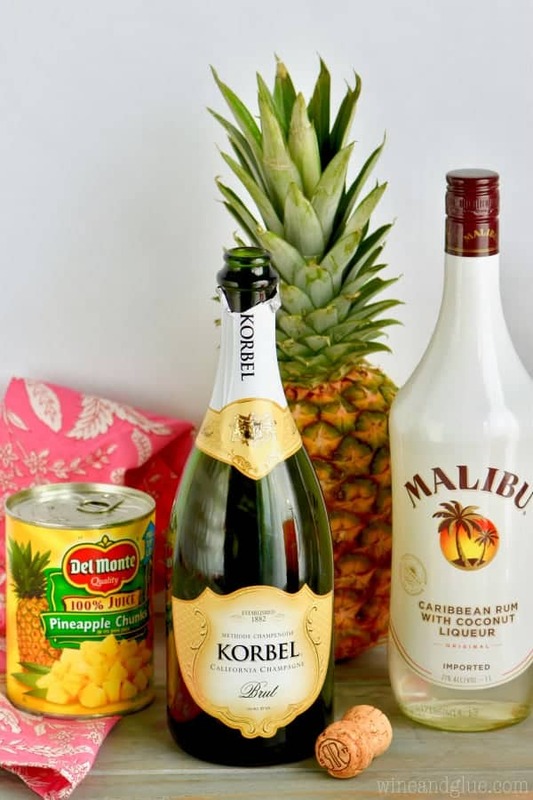 Because this is such an easy cocktail to throw together, if you are going to a party bring all the ingredients for a second batch, but don’t make it until you are ready. Because bubbles. 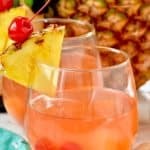 If you are looking for more great cocktails to serve to a thirsty crowd try this Sparkling Cranberry Vodka Punch Recipe, this Stormy Donkey Party Punch (<—— best cocktail name ever), and Strawberry Peach Ginger Ale Party Punch! 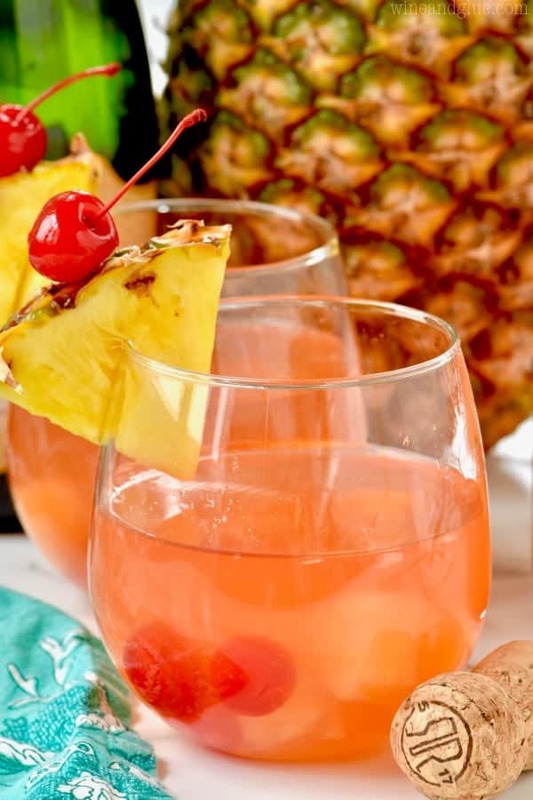 This Pina Colada Rum Punch recipe is made with champagne and takes only five minutes to make! Combine all ingredients in a pitcher. Enjoy! oh my goodness, we’re celebrating christmas in south florida so this is perfect! can’t wait to make it! This sounds so yummy! Do you blend it all together in a blender or just mix? Can I switch the champagne out for moscato? Also is it okay to double this recipe? If you like your drinks sweet, I think that would be fine. But if not, I would drain the pineapple and skip adding the juice, putting just the chunks in there. And absolutely you can double it. Triple it. Just depends on how thirsty you are.